The company spilled about 4,800 litres of medium crude oil at its Darfield station. 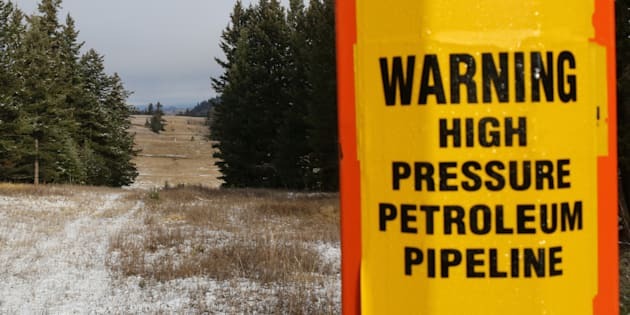 A sign warning of the subterranean presence of Kinder Morgan's Trans Mountain Pipeline in seen in ranchland outside Kamloops, B.C. on Nov. 16, 2016. KAMLOOPS, B.C. — A spill from Kinder Morgan's Trans Mountain pipeline late last month was 48 times larger than initially reported, officials said. The spill volume reported from the company's Darfield station north of Kamloops on May 27 was revised to 4,800 litres from 100 litres, the B.C. Ministry of Environment said Sunday. It said 100 litres is the minimum threshold under the company's spill reporting obligations, so that's why the ministry estimated 100 litres at the time. Trans Mountain spokeswoman Ali Hounsell said the company didn't tell regulators how much medium crude oil escaped at the time of the spill. "Trans Mountain had not provided an estimate of the volume spilled, other than to confirm with regulators that it was over the reportable threshold, until cleanup had sufficiently progressed to a stage where an accurate estimation could be provided," she said in an email. Following an onsite investigation, she said Trans Mountain has provided the updated volume estimate to regulators. Trans Mountain is in the final stages of completing the cleanup, she said. Under British Columbia's spill reporting regulation, Trans Mountain was required to report the spill immediately. The regulation says the quantity spilled should be among the information included in that report, "to the extent practical." The company turned off the pipeline for several hours the day of the spill, which the ministry said came from a leaking flow metre. The spill was contained to the station property and no waterways were affected, the ministry said. Two days later, Prime Minister Justin Trudeau announced the federal government will spend $4.5 billion to buy the Trans Mountain expansion and Kinder Morgan Canada's core assets. Kinder Morgan had ceased all non-essential spending on the Trans Mountain expansion in April, vowing to cancel it unless it received assurances it can proceed without delays and without undue risk to shareholders by a deadline of May 31. After the federal government's announcement, the company said work would be restarted soon, with the government funding construction. The sale is expected to close in the second half of the year.